A January flight to send Gov. Gen. David Johnston to Saudi Arabia to offer Canada's condolences for the death of King Abdullah cost taxpayers $175,000, according to records obtained by CBC News. Logs released by the Defence Department under Access to Information show the Jan. 25-30 trip to Riyadh took more than 40 hours. The January flight to send Gov. 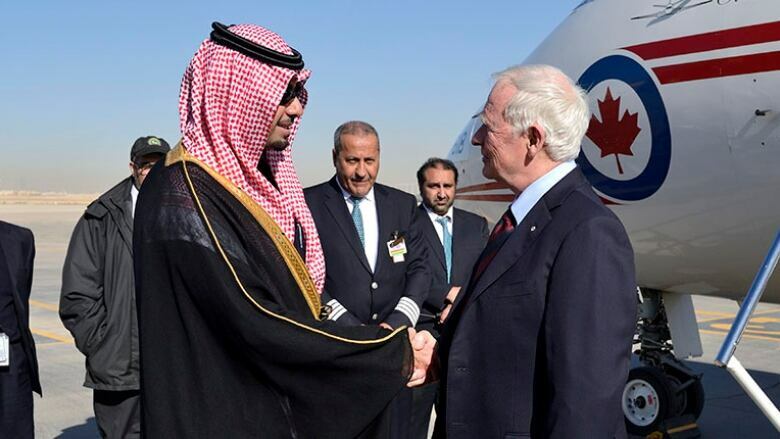 Gen. David Johnston to Saudi Arabia to offer Canada's condolences for the death of King Abdullah cost taxpayers $175,000, according to records obtained by CBC News. Logs released by National Defence under the Access to Information Act show the Jan. 25-30 trip to Riyadh took more than 40 hours, including a side trip on the way home to Vancouver. According to Julie Rocheleau, spokeswoman for the Office of the Secretary to the Governor General, Johnston was accompanied by an aide, an official photographer, security person and two government program officers. Other personnel joined the group on some legs of the return journey. The cost of the flight does not include other costs incurred such as hotels and meals. The Governor General went on the trip at the request of Prime Minister Stephen Harper and was among hundreds of other international dignitaries offering condolences. The U.S., for example, had a 29-member delegation that included President Barack Obama, Secretary of State John Kerry, House minority leader Nancy Pelosi and CIA Director John Brennan. Canada has long had close bilateral relations with Saudi Arabia. According to the government of Canada website, common interests include energy security, humanitarian affairs and counter-terrorism. Last year the federal government helped broker a controversial deal worth $15 billion to sell light-armoured vehicles to Saudi Arabia, in spite of the country's notorious human rights record. The country doesn't allow women to drive and has a high number of executions each year. Rocheleau said that in addition to paying respects to the Saudi royal family on behalf of Canada, Johnston also attended a working luncheon with business and education officials and met with the governors general of Australia and New Zealand in Riyadh. "The RCMP recommends modes of transportation. For security and safety reasons, the RCMP prefers and recommends that the Governor General's air movements be on government aircraft," she told CBC News. Aaron Wudrick, federal director of the Canadian Taxpayers' Federation, said that while attendance at funerals for foreign heads of state is a legitimate activity for the Governor General, alternative delegates could be sent to trim costs. "Given the high cost involved, in some cases it may be worth reassessing whether other forms of travel are appropriate, or whether an ambassador or other representative is able to attend in the GG's place in some cases," he said.